Today, AT&T officially announced plans to acquire DIRECTV for $48.5 billion. AT&T thinks the combined companies can become a content distribution leader across mobile, video and broadband platforms. For now, this move shouldn't impact AT&T wireless service at all. The unannounced Moto E recently made a brief appearance on Motorola Mexico’s Facebook page, only to be pulled by its publisher. This quick sneak peek gave us a look at what we might see during the company’s media event on May 13th. We will bring you more details as they become available, what do you think is Motorola/Google/Lenovo doing it right with the Moto E? Dish Network Chairman Charles Ergen wants Dish to become a wireless carrier. Ergen was shot down twice when Dish was outbid by SoftBank for Sprint, and outbid by Sprint for Clearwire. Ergen also put in a bid for bankrupt third party network provider LightSquared only to see another party interfere yet again. Earlier this year Dish finally won an auction for H-Block spectrum for $1.56 billion. Which made Dish the fifth largest holder of spectrum. Ergen has said he would let Sprint bid on T-Mobile. If Sprint's attempt to buy T-Mobile fails Dish will step in to buy the fourth largest U.S. carrier. Ergen says that Dish doesn't have cash flow to outbid Sprint for T-Mobile, Ergen would rather sit on the sidelines to see how a Sprint T-Mobile deal pans out. Earlier visits to the FCC and FTC by Sprint chairman Masayoshi Son, and Sprint CEO Dan Hesse, went poorly for the nation's third largest carrier, which doesn't look good for a Sprint T-Mobile deal. However, regulators like the possibility of Dish becoming the fifth largest wireless carrier in the U.S. The FCC has already approved Dish's request to use some of its recently purchased H-Block spectrum for satellite transmissions, as a conduit for cellular calls and data. Our friend @evleaks has been tweeting a lot about the Moto G lately. 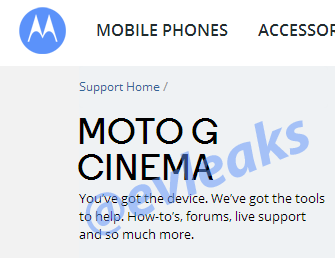 Today is no different, a mysterious screenshot taken from Motorola’s site listing a “Moto G Cinema.” has been leaked. There isn't much to go on here. We're not sure if this is a new phone, simply a software feature, or could this be part of Motorola's May 13th announcement in London? According to the Financial Times, Apple is currently in negotiations to purchase Beats Electronics for a sum of $3.2 billion. The deal could be made as soon as next week, but from what sources state a few terms need to be ironed out first. If the deal goes through for $3.2 billion this would be Apple’s largest acquisition to date. Unlike HTC, Apple’s deal would be for all aspects of the company. Which would include hardware, streaming music services, and all that falls under the Beats name. We'll keep you posted as news comes available, in the mean time what's your take on Apple buying Beats Electronics; leave your comments below? A couple of weeks ago software developer Florian Kiersch leaked an unannounced Google platform known as Stars. From what we can see in the video, Stars is Google’s next generation take on bookmarking content from the web. Up until now, we've only seen pictures of Google's unannounced Stars, however Kiersch was able to gain access to parts of Stars’ web-based UI. While the included video leaves a lot to the imagination, the video shows the set-up process and how to organize content folders. OnePlus heard you loud an clear OnePlus' Smash the Past contest officially wrapped on May 2nd, and in addition to revealing how many people applied for the promotion OnePlus has also altered the program slightly. OnePlus has announced that it’s adding a new option to its Smash the Past promo that will allow winners to donate their smartphone rather than destroying it. Originally, the contest called for 100 applicants to smash their smartphone in exchange for the ability to buy a OnePlus One for $1. Now OnePlus says that those winners will also have the option of donating their device to Medic Mobile, a nonprofit that gives phones to healthcare works around the globe. OnePlus spent the months leading up to the One’s debut by trickling out its spec details to help build hype for the device, so it’s no surprise that the company came up with a unique contest for consumers to buy the One. The original Smash the Past promo caught quite a bit of flak, though, with many suggesting that winners could do something much more useful with their old phone instead of smashing it. It’s nice to see that OnePlus took that criticism to heart, and hopefully the Smash the Past winners decide to donate their devices instead of destroying them. Along with this new Smash the Past donate option, OnePlus also dropped a few interesting tidbits about the promo. The company says that more than 140,000 people applied to smash their phones and that some of the more creative destruction methods that were suggested by users include using a flamethrower on the device, throwing ninja starts at it or cooking it with spaghetti bolognese. A few weeks back rumors surfaced that Motorola Mobility was working on a device called the Moto X+1. While we're still haven't officially heard word from Motorola, Lenovo, or Google at this point in regards to the Moto X+1, recently the mysterious device was spotted in Motorola’s MotoMaker. Motorola has since removed the listing, but not before a screenshot was captured (pictured above). Motorola Mobility however has recently announced that it will be hosting a press event on May 13th where it will unveil its next smartphone. Hopefully Motorola, Lenovo, or Google (whatever they're calling themselves these days... lol) will shed some light on the dark spot that has been the Moto X+1.